Muscle injury. Should I rest? As you nod in affirmation – the mind is screaming “Noooooo”!! Thoughts of missing club runs and rides; fitness going out the window; weight piling on and all those evil things that happen to the body whilst you do “nothing”. All thoughts are based in our anxiety of losing our hard worked fitness but research tells us that it is very easy to get these gains back again. I’ts not so easy to get fit again after you have been injured. What happens when we injure a muscle? Muscle are bundles of elastic tissue made up of millions of sarcomeres and when these tear they bleed. Blood in tissue causes pain and inflammation – but this is required in order to repair the muscle. Unfortunately our muscles heal with fibrous tissue, like a scar, which is much less elastic. I suppose it is like joining an elastic band with a piece of string. This scenario faces us all far too often in the sporting world, especially in our cohort of “Weekend Warriors”. These are sportsmen and woman who love their sport as much as the Professionals but just don’t have the time and financial reward to be able to do it full time. We have limited time to spend on recreational sport. An injury is not part of the plan and a real nuisance. We start to think that perhaps if we try to return to sport just that little bit quicker we could minimise the potential loss of strength, conditioning and fitness. The bodies structures, in this case muscle tissue, need a period of rest to repair. There is no known way to accelerate this process. By trying to accelerate the body’s repair this will more than likely lead to a weaker level of healing structures. The pace at which our bodies repair is mostly down to age and genetics and there is very little in the way of external stimuli that can improve this. I have encountered many young people taking Growth Hormones and any sort of supplements to “speed up the healing”. I would say this only makes the tissue more vulnerable to injury in the future. The biggest reason people tear muscles (hamstrings and calf) is due to previous tears, so it is vital that we get the muscle to heal up in the best possible way the first time it is compromised. This starts with a period of rest – and this is not a definite time. It is until the muscle is able to contract without causing pain or further tearing to the muscle fibres or sarcomeres. Resting does not necessarily mean feet, but could mean a period on crutches or immobilising a joint like the ankle. The best way to test whether a muscle is ready to be progressed is with a static or isometric contraction where the muscle contracts but the joint does not move. Once a static contraction is possible then we start to load the muscle. Time-frames depend on the depth and extent of the tear. All this very important information will be given to you by your treating therapist. It is our responsibility to ascertain the extent of the injury and therefore the period of rest. There will be exercises that you will be able to do but this may be a form of cross training that is not putting the joint or muscle involved at risk. If you have anxiety about rest, share this with your Physiotherapist. They would have dealt with it before, and it is within both your interests to get you to comply with your exercises and treatment protocol. The next steps and decisions will be made on the presumption that you have been compliant, so be honest if you have not rested. 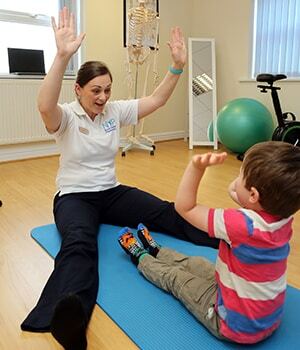 At North Yorkshire Physiotherapy we treat all muscles strains and injuries. To get expert advice or book an appointment with one of our physiotherapists call the clinic on 01642 208975 or book online.